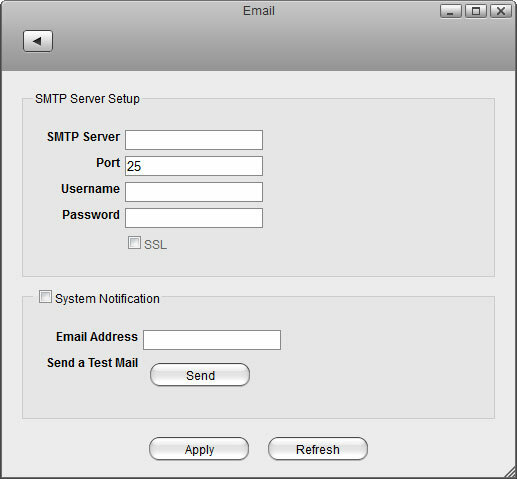 To send e-mail invitations and receive system notifications in your mailbox, set up a SMTP server. If you are using a free e-mail account, check if it supports POP/SMTP to receive and send your mails. If not, ask your internet provider for an account that you can use to send mails via their mail server. When using Gmail from Google, make sure to allow less secure apps to access your account. SMTP Server Enter the IP address or domain name of your SMTP mail server (e.g. smtp.gmail.com). Port By default, the SMTP server uses port 25. When SSL is enabled, the default port is 465. Change the port number accordingly if your mail server is using a different port. Username Enter the username of your email account. Password Enter the password to your email account. SSL Select the checkbox to enable a secure SSL connection. Disable this option if your mail server does not support it or if you have problems sending mails. Drive is full (used storage capacity is over 95%). Drive temperature is high (over 75℃). Other hard drive related issues. Email Address Specify the email address where the system notifications will be sent to. Send Click Send to send a test mail to the above email address in order to check if the SMTP server setup works.